The Meditub 3140 features a shower enclosure and is constructed of the highest quality industrial strength acrylic for beauty and durability. 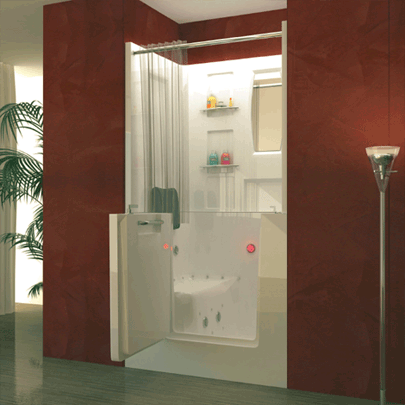 It is ideal for replacing existing shower stalls and also can be used in small bathrooms. The built-in grab bar, 17” (chair-height) contoured ADA compliant seat with a full sized, knee-curved door means you won’t find yourself struggling to enter or exit this walk in tub. Constructed with a stainless steel frame for long lasting strength and adjustable for easy installation and leveling.